For high-powered applications EXEDY offers Multi plate clutches. These are designed for hot street action as well as drag, road, and rally racing. All of Exedy's multi plate clutches come with a lightweight chromoly steel flywheel, and the famous purple anodized forged aluminum clutch cover. Featuring a T5001 cerametallic friction materials for extreme heat resistance. Rated to hold Approximately 615 ft/lbs of torque to the wheels. I pair this clutch with a DSS carbon fiber drive shaft. The drivability of this combination is better than OEM. It took a day to get used to the low catch point and how well the clutch grabs. Make sure you break this clutch in rite because I have very little chatter. The clutch only chatters when the pedal is pressed in! It is quiet when engaged. Everyone that has driven my car since I installed this clutch has been amazed. The act clutches hav nothing on this as far as DD ability. This clutch is great. I had a Competition Clutch Stage 3 full faced kit before this clutch. I burned out that clutch with 25k miles and was quite disappointed with it. This clutch on the other hand has taken a serious beating with over 40 passes at the drag strip. Does not over heat or slip at all. I'm making 430whp/385wtq on a mustang dyno. Would highly recommend. I ran this clutch hard and it lasted me till I got about 30,000 miles on it. This clutch can really take a beating, and it does not over heat quick. It does not give you the 6puck jitter from dead stop, and the friction point is a wider range which I like. I give this a 4star because it is a noisy clutch, its noisy when you are stop at a light when the clutch disengage at idle, and its noisy between shift. 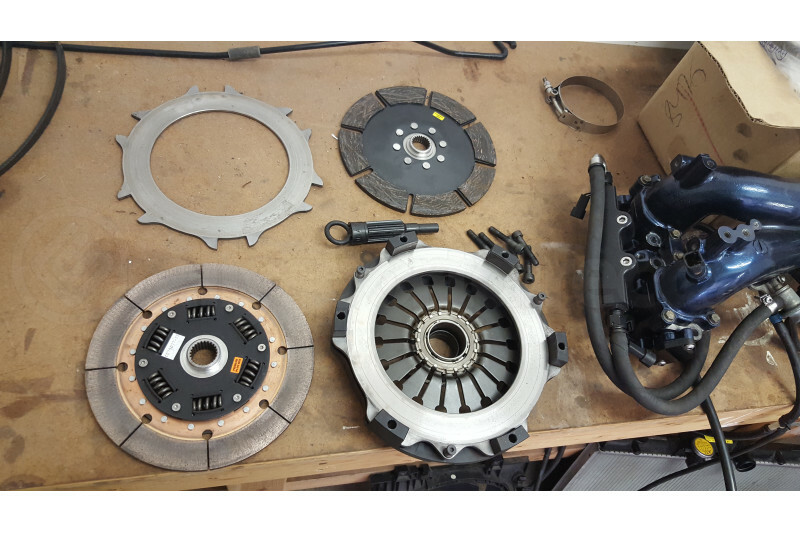 But if you like me and care more about performance then you do about noise then you will not be disappointed on this clutch, also note there is a rebuild kit for this clutch so when you wear out the disk you don't have go out and buy the whole thing again. Even though this clutch is more of a racing clutch, would this clutch last as an every day driver? I am doing a build for a 700 hp detuned for a 500 hp every day driver. A: It will take a bit of getting used to driving, but this clutch will work on a daily driver. I have the Clutch Masters FX850 and it's a light switch and shakes the car violently even though 1 disk is sprung. The pedal is OEM soft. I only have 40 miles on it but I'm considering going with something else. How would you describe the bite and initial take off? Are both disks sprung? A: This will have a much stiffer bite and take off making the overall feel of the clutch VERY stiff, this will be nothing like OEM. It is made for racing and not for street use so keep that in mind. A: The master cylinder does not need to be modified. We recommend that the slave cylinder restrictor pill to be removed. There is instructions in the user guide on how to do this. Hello can you confirm fitment for 2011 STi? I was doing some research on Exedy's website and they listed this clutch to fit 2004-2010 only. Can this clutch be installed in the jdm sti? A: It should however, we can not guarantee fitment on JDM cars.